Jawbone are not new to the fitness tracker market. 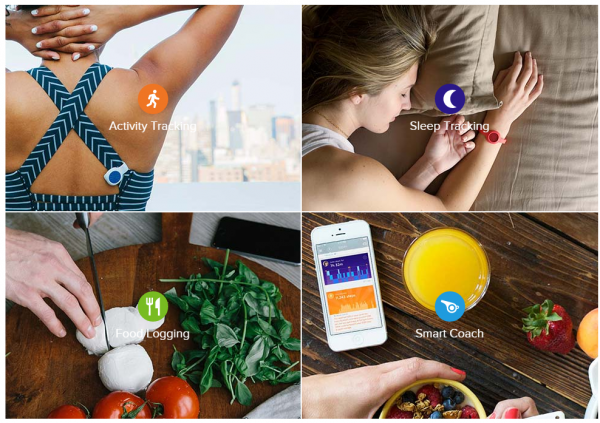 Along with Fitbit, they have been providing fitness trackers to the masses. However, Jawbone have always focused on providing the premium product to the consumer, i.e. their trackers have always been a bit on the expensive side. Not any more. 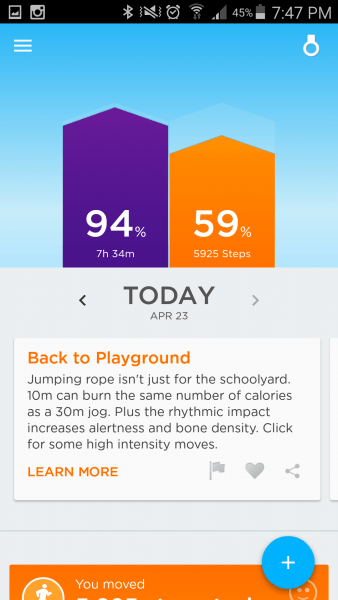 With the Jawbone Up Move, you have no excuse not to subscribe to their fitness products. At only £39.99, this offers you a fitness tracker, a sleep tracker, a food logger, and best of all, a smart coach. Out of the box, the device, which is a small circular disc, comes with the strap shown above. This can be hooked to your clothes, but if you’re going to bed, it is advised that you wear it on your wrist. 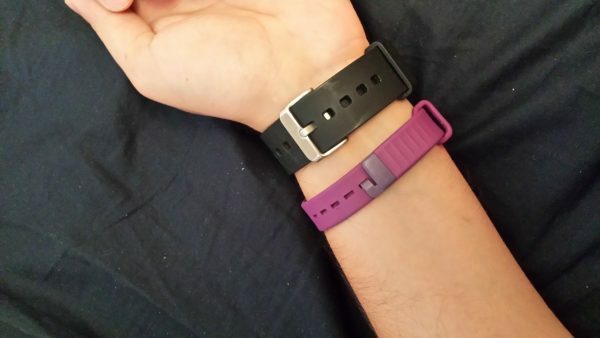 I generally prefer my fitness bands on my wrist anyway, so I went for the wrist strap option. Note that you have to pay extra for the wrist strap, and it doesn’t come straight out of the box. Not much bigger than a pound, and very light, this doesn’t look too bad. However, you don’t quite get the same finish as you get with rest of the Jawbone range. At a fraction of the cost though, you can’t really complain. It has a sideways latching mechanism. However, after a couple of weeks of wearing this and using it in different modes, it works well, and stays on, and is comfortable. Not much to report on that. 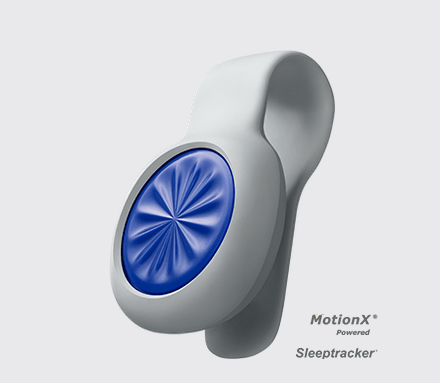 The front face includes some LEDs, and the whole face acts as a big button which can be used to enter sleep mode, awake mode or start and stop a timer to log your activities. 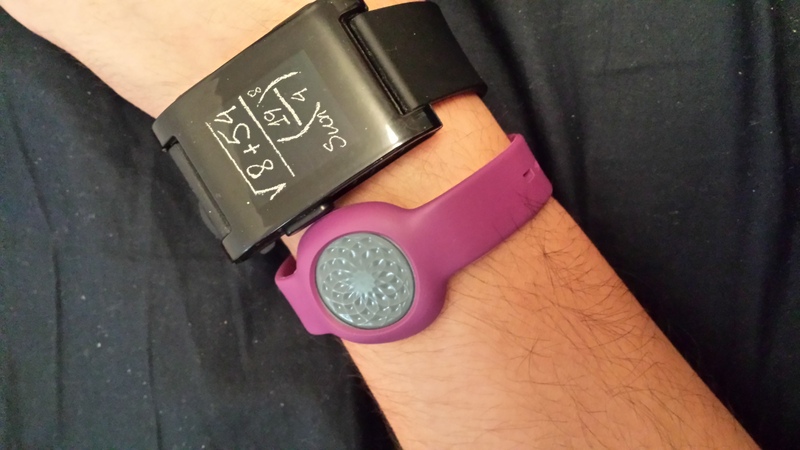 The LEDs normally tell you how much of your daily goal you have achieved. Apart from the basic interaction with the device, the usage really comes from installing the app on your device. As of now, apps are available for Android and iOS devices, and our test consisted of using the Android app. The device pairs with your phone using Bluetooth. Once the app was installed, the app found this device straight away. You have to create a user and login, and this is so that a profile can be created for you online. Your data is often uploaded to the Jawbone servers, and analysis comes flying down through the airwaves. How does it track things? There are two ways to track things. You either tell it that you are doing things, by pressing PLUS (or add) on the app, and go for it. Or you press the buttons and tell it what’s up. I have gone for the lazier route, mainly because I am curious, want to test its abilities, and mostly because I can’t be bothered. And what is the lazier route? You just don’t do anything. You sleep, you run, you jog, you play. After you are done, it will ask you if you were alseep, or if you were doing something during some time. At that moment, you can fill in extra details about your activity, and things such as stress levels and how you felt. Of course, the same magic doesn’t apply to your food intakes, and those you have to enter yourself. Interestingly, it even has entries and information already about Pakistani foods (I had Haleem today, yummy, 250 calories in one serving). There are easier routes, you can scan the label, find it on a list, or take a photo. How well does it track everything? Pretty well, I’d say. 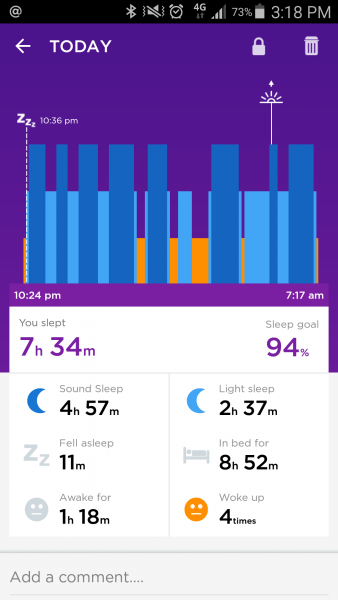 I am a bit unsure about sleep tracking, but then again it is hard to keep a tab on that as you’re probably asleep when it thinks you are. For example, last night was one of my worst nights in a long time. I would have said that I was awake between 1 and 3.30, but it seems like I had been falling in and out, but had actually got up and seen the time at those two intervals. 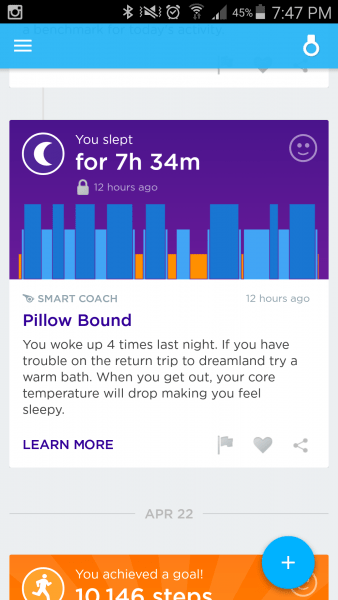 What is the purpose of sleep tracking though? I am still trying to figure that one out. Then again, I am pretty sensitive when it comes to sleep, so perhaps I don’t need one. So, what is this smart coach thing all about? It is basically the app talking back to you, commenting on what you have done. It throws in tips, and tricks, and often encourages you to exercise. Take a 10 minute walk, you’re close to your average, just x more to go before you reach your goal. Does it work? As sceptical as I was to begin with, yes. Yes, it definitely works. I have been going running every morning all this week, and while the weather takes some of the credit, there is definitely something that is egging me on, and I have a teeny tiny suspicion that it may be the Up Move and its smart coach. It retails for £39.99 and can be bought directly from the website. It comes in a range of colours which are complimented with the clip. The straps also come in a range of colours, though they have to be bought extra and cost £11.00 each. It has taken a lot of humans to try and get me to run, but none has succeeded like this little device. For that and that alone, it gets a major thumbs up from me. Get one, you won’t regret it.